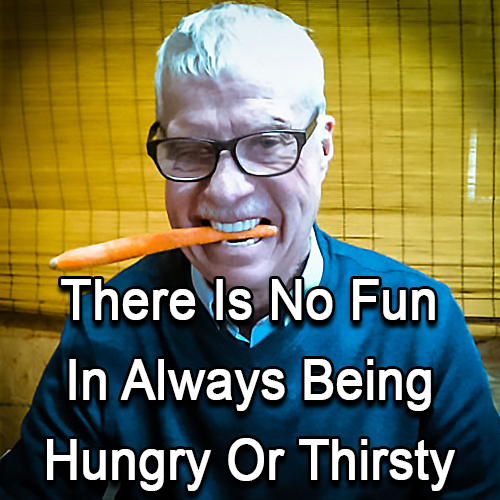 There is no fun in always being hungry or thirsty. Starvation diets, fasting, and all the fad diets should be avoided. In today’s world, here in the good old U.S.A. we have an abundance of decent food. We can be healthy and happy with just a little attention to your daily food and lifestyle. We don’t need to be perfect, but we should pay attention to our body’s basic needs. There is no fun in always being hungry or thirsty. We come in various sizes, colors and shapes and one doesn’t seem to be superior to the next. We have a mind-boggling array of brain types. Some of us don’t even seem to have one of those things called a brain, or at least we don’t appear to use it. Starvation diets, fasting, and all the fad diets should be avoided—yes, even shunned. Boot the thought and the monster out of your life. All that we need to do is use a little common sense—just a little, and we should not be ashamed of having a feast or a party now and then. That makes life fun and it also permits us to laugh at ourselves and each other. We should treat ourselves as if we were a valuable race horse. Yes, manage your life as if you were a prize dog or first rate cat—even. Give your body and mind some decent attention—and you may delay giving it an early burial … now that is worth some serious thinking. At any rate it takes very little effort to make the journey through life to be as pleasurable as possible. If one person wants to follow a camel across the desert and wear sack-cloth in penance, that is ok. Let him do it and don’t condemn the poor soul. It is his God-given right to do so. Your magnificent body will take whatever you put into it and will survive—we don’t need three balanced meals each day. And we do not need to eat vitamin and mineral supplements. All we need is to eat a wide assortment of decent foods from time to time. The generally accepted concept of three, balanced, meals each day is bogus. That idea must have been thought up by someone with an ax to grind. Hang up on that thought, go lie down until it leaves your pointy little head. No one knows what a balanced meal is anyway. We can make almost anything that we need—all from scratch; even much vaunted protein. Our bodies will make protein from the plants that we eat. We really should pay some attention to getting a wide variety of plants especially mighty greens into our diet each day. Mankind has never had access to three “balanced” meals each day—whatever that might mean. However, we don’t need to be hungry or thirsty. We homos have barely managed to survive by eating whatever we could find—before we were dined upon ourselves. Our bodies will use what we need, store the essentials and discard the rest. We have evolved, or were designed to survive, and we did survive. That is some kind of a miracle, seeing that we have no antlers, claws and can be outran by almost anything that is hungry. Don’t pig-out on too much bad food and don’t ignore the good food. We all know what is healthy for us and what is not. We are not stupid!